I appreciate their consistent communication and efforts to visit our facility to obtain additional information when needed. IN-FAB is a leading manufacturer in the automotive industry for shipping and in-house containers. We take great pride not only in our products, but more so in the relationship we share with our customers. Availability, clear communication, and providing immeasurable service to our customers is our top priority. With the latest technology and machinery, including a 5 axis water jet, CNC router, dual station robot cell, and 4 production lines, IN-FAB can produce up to 150 medium complexity racks per day. This technology allows us to customize dunnage such as HDPE and XLPE foam in-house eliminating long lead times and issues with quality. 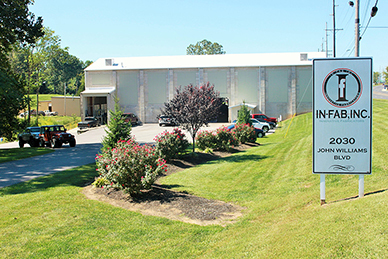 We, the employees of IN-FAB, Inc., proudly pronounce our personal commitment to understand, meet and, when possible, exceed our Customer's Requirements through the continuous improvement of our processes. We are dedicated to delivering defect-free product on-time at the most competitive cost possible.